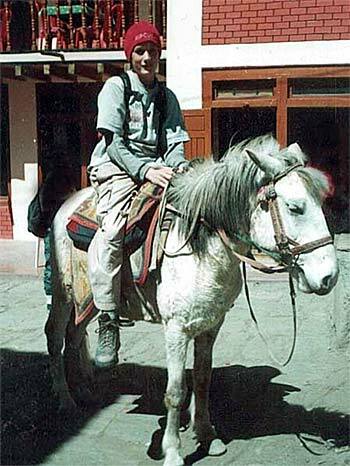 What to Wear - Trekking in Nepal with Teresa, Slow Trekking for peoples of all ages. Unless you are planning to do more high-altitude trekking you probably don’t want to buy lots of fancy clothing and equipment. When packing, don’t worry about the weight. You shouldn’t need to do much more than man-handle your pack around. The porters are used to carrying much more weight than this. As a guide, 20 kg is about the maximum for trekking (15 is ideal) and a few kilos more is fine with the airlines. Remember, you don’t have to take all your belongings with you on trek. You will need a good wind-proof, water-proof jacket. It doesn’t have to be warm; you can layer-up underneath it. I like to carry a pair of water-proof over- pants but I hardly ever use them. Both these items are available in Kathmandu (that’s the city not the shop) at a very reasonable price (around $40 for a jacket). The quality is ‘reasonable’. You may not need to use it but if you do it may save you. I've found CROCS fantastic lately. With socks when cold, otherwise without and also good for the shower. Very light in your pack. Cheap copies are available in Kathmandu and Pokhara ($5). Long bottoms and long sleeved tops - Nice warm undies are next in order of importance 2 pairs (they can double as pyjamas). 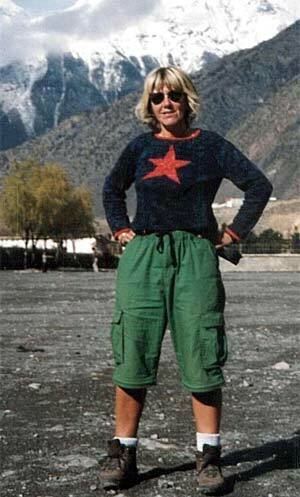 You will mainly wear them for ‘apre-trekking’ such as sightseeing in the village or sitting outside on a terrace reading which can get chilly as the sun disappears very early in such steep-sided valleys. Plenty of normal undies too of course, a pair of ultra lightweights that will dry by the fire are handy. On average we can do a little washing every four days. The rest is up to you. Some women like to trek in skirts. I am frequently asked at checkpoints ‘Sir are you male or female?". If you wear a skirts you need leggings or trousers underneath in the countryside as bare legs are considered a bit ‘flashy’. If you wear shorts (men or women) keep them baggy and long for a more decorous look. I have a pair of pants with legs that zip off later in the day when it warms up. They are great. You can buy them in Kathmandu. Loose trousers are easier to walk in if you are taking large steps uphill. Track pants are easy to wear after trekking and will still fit you when you loose 5 kilos – fleecy ones are a bit warm lower down but normal ones are a bit cool higher up. Two pairs are ok.
Trekking t-shirts are marvelous. Unlike cotton these hi-tech tops let the sweat evaporate quickly so you wont get chilled when you stop for a cup of tea in the shade. Long and short-sleeved 'fakes' are available in Kathmandu and Pokhara for about $6. However, no XL sizes are available. A thick, snug fleece is the most useful thing to bring or buy in Nepal. I prefer a front zip, rather than a pull-on as its easier to get on and off and on and off. Some jackets have a zip-out fleece built in. I have a super-down jacket. It cost $50 in Nepal. It weighs almost nothing and compresses into a tiny bag. It is very warm yet not bulky. Buffs have become very popular. A circle of cotton jersey which you can wear round your neck, around your wrist, over your hair when it gets disgusting (and it will get disgusting), as a scrunchie, or over your nose and mouth when the gritty wind is blowing in your face. Just a few dollars in Kathmandu..
Ladies, a sports-bra or those elasticated crop-tops can keep you comfortable. A long day of down-hilling can have you jiggling way too much for comfort. A good sleeping bag will reward you with a good night’s sleep. If you don’t want to shell out a fortune in Australia you can get one quite cheaply in KTM. If yours is not quite warm enough you can buy a fleecy liner there as well. On trek we will be given quilts at night if it is cold – very cosy although not always the cleanest. You will need your own toiletries and towels. Trekking towels dry quickly and are light enough to keep one in your day pack. You will need to have your own little medical kit, sewing repair bits and bobs and a good torch (I love my new head-torch with LED lights so the batteries last for ever). Your pack can be large if you like. You may take home a lot more than you came with. Even if you bring better clothes for looking good around town you don’t have to take them trekking with you. We can leave things in Kathmandu and Pokhara quite safely. A well-fitting daypack is really useful. It should have pockets on the sides for access to your drink bottle (I like the aluminium ones) and sunscreen (which you will want to reapply hourly if the sun is shining on the snow). In this pack you’ll keep a spare fleece or jumper (fleece is lighter), maybe a plastic rain poncho and your camera and film. Bring a couple of good books you’ve been meaning to read. There is a fair bit of sitting around time and you won’t be carrying them. Around town I like to wear ‘salwar kamiz’. It’s a longish A-line fitted dress over baggy trousers. Have one made in Pokhara! Accessories are up to you. Definitely good sunglasses. (If you wear prescription glasses best to bring a copy of the script in case you lose them). Or perhaps an old pair as a ‘spare’. Light coloured sunglasses will be inadequate. Wrap-around sunglasses will keep the glare out of the sides and the gritty wind. A warm hat is a must (you can buy cute ones there). Also a sun-hat is very useful. Early on the trek it will be sunny and hot and it is also useful for warm sight-seeing days in town. Good ski gloves could get forgotten or pinched. There are cheap gloves along the way if we decide we need them (homespun wool or fleece). I like a big scarf to use around my throat when cold or around my face for a gritty wind. I also take a huge scarf/sarong (bought up there) which I use to walk back from the shower to my room or to lay over the pillows if they don’t look too clean. (remember, this is trekking and a couple of the lodges are fairly basic). Last but definitely not least do take decent socks. The socks in Nepal have been uniformly shocking but recently a shop opened up in Thamel selling rather good socks at reasonable prices. Good socks. Good socks. Good socks. It’s my mantra. 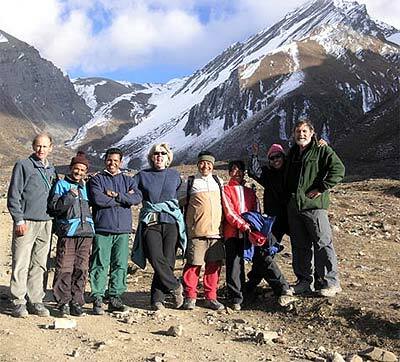 So if you put this list together with the Health Issues list you will surely be one of the best-equipped trekkers to set foot in Nepal since Sir Edmund Hillary. You do have to remember which bottles you’ve done – be systematic. Trekking pillows. I take a little pillow myself but have neglected to recommend them in the past. Sorry. The pillows in the lodges are ‘variable’. The main piece of advice here would be ‘don’t bring too much – if undecided then look to purchase in Nepal’. I am happy to help with this on your shopping day prior to trekking.